User defined parameters such as size, dimensions, and color. Everyone who handled the materials and what they did with the materials. Materials that were consumed to make or process other products or added to assemblies. How long operations took, how much labor was required, and what materials were consumed, returned, produced and scrapped. This data is captured in the time tagged tables shown in the above diagram in a format compatible with materials tracking and traceability requirements such as those from ISO, FDA, USDA, HACCP, and the DoD as well as those required by environmental, sustainability, and hazardous materials regulations. This data can be viewed through standard reports and Excel exports. As BellHawk uses a standard SQL database, these tables are accessible for users to produce custom reports using a wide variety of reporting tools. They are also accessible for exporting to external systems through the BellHawk web services (SOAP/XML) interface as well as through a VB.Net SDK that uses an ODBC connection to BellHawk. A toolset called BellHawk SCI is also available for implementing reliable automated data exchange interfaces with BellHawk. 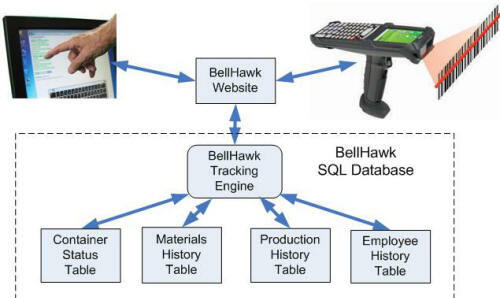 The data that BellHawk captures typically comes from wireless mobile computers equipped with integral barcode scanners or PCs equipped with barcode scanners. But it can also come from interfaces to weighing scales and process control equipment as well as from RFID tracking systems and test stands. Please click here to learn more about BellHawk Systems Technology.